The magic of Photoshop and other image altering programs have opened 80s minds everywhere to a "What If..." world. Sometimes forgotten in the history of Nintendo is the zapper gun. 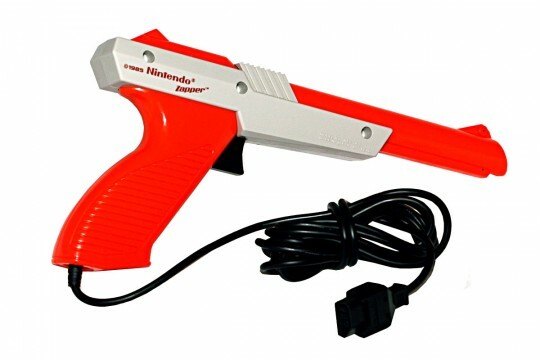 Used for games like Duck Hunt, Hogan's Alley and Operation Wolf, the zapper gun was first released in 1985 as an accessory with the Nintendo Entertainment System (NES) console. About 18 games were designed to be compatible the gun during its lifetime. Notably, it was one of the weapons used by Kevin in the cartoon series Captain N: The Game Master. Now, with image altering software and crazed 80s brains (such as mine), the Nintendo Zapper has been brought back to life in a new way. NullPoint84 on Flickr has inserted the zapper into famous iconic movie scenes including Star Wars (now we know why Guido missed,) James Bond, and Pulp Fiction. You might have seen some of these Photoshopped masterpieces already on sites like Buzz Feed and FunnyOrDie. But since I just stumbled onto them recently, I figured it was worth passing along. Enjoy the Nintendo zapper in famous movie scenes! The creator of these takes requests. I think I'd like to see Robocop with zapper gun at his side. What are some other movie scenes that a Nintendo zapper would be a fun substitute? Leave a comment with your suggestion! That Taxi Driver image is glorious. I'd like to have a blown-up framed print of it for my game lair.